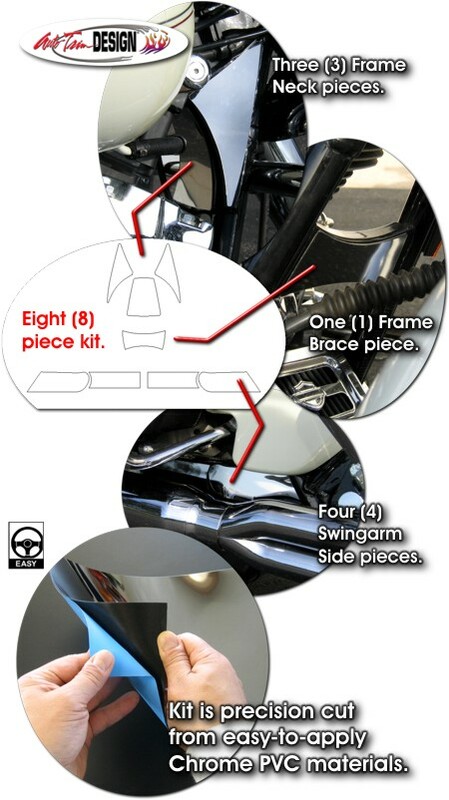 Detail your Harley-Davidson Touring bike with our eight (8) piece Chrome Kit. Manufactured from Chrome PVC materials, each piece is precision cut to fit in the areas shown and comes with easy-to-apply foam tape already attached to the Chrome PVC backing. Chrome PVC, specifically designed for the automotive aftermarket, consists of a high polish mirror-like chrome faced polyvinyl with High-Performance 3M® 4229 Adhesive for secure and aggressive mounting on just about any clean surface. With an overall thickness of 1/16" (1.5875mm), Chrome PVC is more than just a decal. The product adds a distinctive decorative touch to any application and won't rust, chip or fade. Moreover, it is chemical resistant. Simply clean the areas of installation, remove the backing tape and apply. Easy! Should take no more than thirty (30) minutes to set your bike apart from the rest! Please Note: Factory welds in the areas of application may vary slightly. While pieces are precision cut, careful trimming with a sharp utility knife (prior to installation) may be necessary for proper fitment. Also, due to the fact that the Frame Brace is used, at times, for attachment of wires or accessories, holes may have to be drilled for screws/fasteners. Kit for '96-'01 bikes come with six (6) pieces. Swingarm Sides are one (1) piece in lieu of two (2) pieces as shown.